If you ask Natacha Ramsay-Levi to define her own style, the answer won’t be as straightforward as you would expect from a designer. “I admire people who have a uniform, but I’ve never found mine and I probably never will because I love fashion’s diversity,” she explained. Pre-fall 2018 is Natacha’s second collection for Chloé, a female-loving French maison, and it already feels that even if she doesn’t have an arbitrary ‘look’ that has to end up in the stores, she feels here like at home. And that’s good – thanks to that, the creative director’s work has a sense of easiness. What we discovered about Ramsay-Levi in her debut last September is that she has a soft point for jaw-dropping boots and whimsical jewellery and those pieces smoothly transit into perfect autumnal days. Here, it’s a strong game of cognac leather coats, shirt-dresses and 70s blouses. 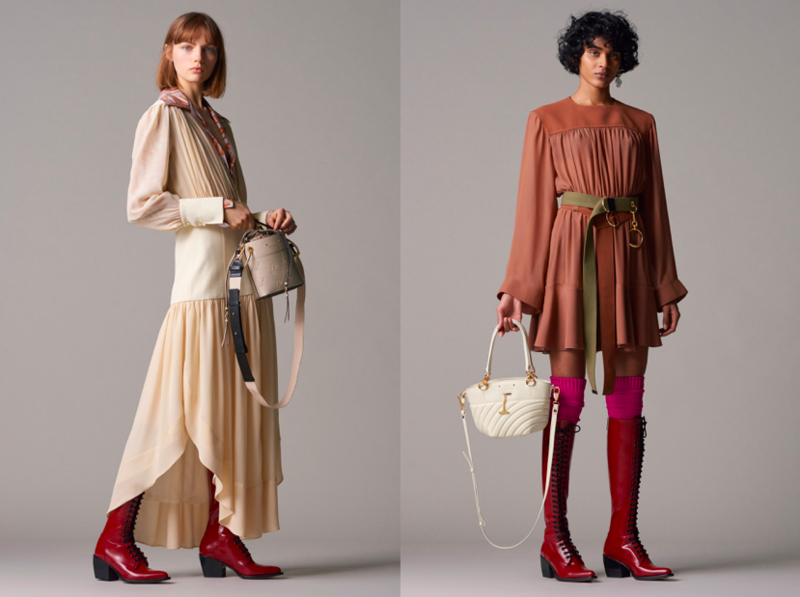 Also, the designer wisely does the horse-rider style that’s distinctly Chloé, whether we’re speaking of the tiny horse prints on bags or wool capes. Although white socks tend to get on my nerves after 2017’s Vetements obsession, the way Natacha pulls them off in her refined pre-fall makes you wonder, whether luxe-y athleisure is back. This entry was posted in Trend Reports and tagged 2018, Chloe, Natacha Ramsay-Levi, Pre-fall 2018. Bookmark the permalink.